Gaming is an advertising medium which is driven by engaging content and cross-platform solutions and, increasingly, brands are taking notice with higher advertising spending across console, social and mobile. During this informative and fun session, we will focus on the content and audience of today’s game play which is the focus of the IAB Games Committee. You will learn the latest statistics from newly released, updated Nielsen research including trends on who is playing, where they’re playing and when they’re playing. And we’ll share three short video case studies of IAB MIXX Award finalist entries showing highly entertaining and engaging game advertising creative with proven results for brands. Last year's SXSW attendees really liked the videos which sparked a lot of great discussion during the Q&A session. 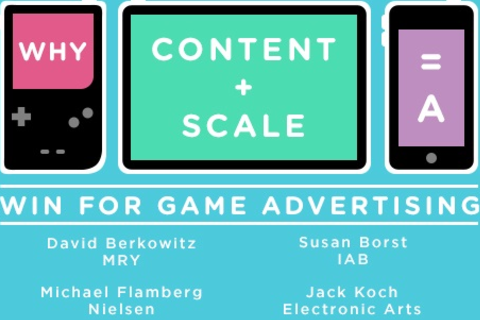 Come join us and walk away with a better sense of the value and scale of game advertising. David Berkowitz is Chief Marketing Officer at agency MRY, where he leads communications and brand strategy while promoting the agency’s work with clients such as Johnson & Johnson, Visa, and Adobe. A fifteen year digital media veteran, he was previously VP of Emerging Media at agency 360i, where he co-founded its social media practice in 2006 and then ran its Startup Outlook initiative. David has written more than 500 bylines for outlets such as Advertising Age, MediaPost, and Mashable, and he has authored his own MarketersStudio blog since 2005. He has spoken at more than 200 events globally. Over 10 years working for one of the most highly regarded research companies in the world, Nielsen, with focus on games. A leading authority in the games research field. After 20+ years at leading NYC traditional creative ad agencies such as Grey, Hill Holliday, Kaplan Thaler Group and Gotham working in senior Account Management and Strategic Business Planning roles on top brands from P&G, Pfizer, Verizon Wireless and more, Susan moved to the digital space in 2010. At the IAB, Susan leads the Social Media, B2B, and Games Committees plus the Content Marketing and Native Advertising Task Force initiatives. She works closely with hundreds of digital publishers and technology providers to set guidelines and industry thought leadership. Recent speaking engagements have included OMMA Native, Business Insider Ignition, Social Media Week (NY and Chicago), and SXSW(2013 and this year, on Friday, March 7.) She was recently named to be on the jury for The Shorty Awards. Susan is also half-Icelandic, but loves Swedish Fish.